“The sounds of shots had been distinct during all my swim. I don’t know how many were fired, but they kept on during all the time I was within hearing distance. I saw an officer, it may have been the captain or it may not, shoot himself before I got away from the ship." Francisco Call of August 12, 1912 (Don Lynch). 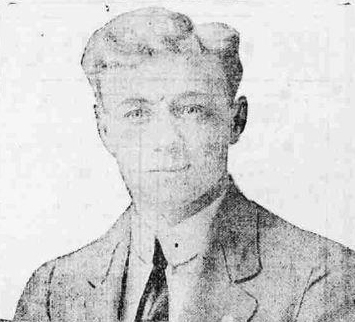 Bill Wormstedt, in reviewing these two newspaper articles, believes the shooting of the stewards may have taken place at the lowering of collapsible C, remarking that “the surviving occupants of Collapsible C did not report any killings, though some did mention warning shots.” (Bill Wormstedt, Shots in the Dark (12.)). As already seen, the shots fired at collapsible C took place well before its launching, allowing Bruce Ismay to eventually make a departure in it. It is more likely that the events Dorking relates took place at collapsible A, where some survivors recall seeing shootings and/or a suicide. However, Wormstedt does point out that since “Dorking was saved on Collapsible B… [he] would have been on board the ship close to the end” and also notes a “similarity between what he claimed the officer had said, and what Daly claimed the officer had said”. Eugene Daly recalls that “an officer pointed a revolver and said if any man tried to get in, he would shoot him on the spot”. Dorking collaborates this when he recalls the officer threatening “to kill the first man who got into a boat without orders”. 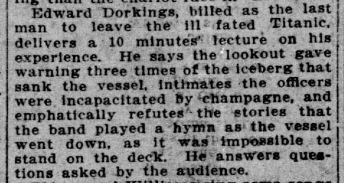 According to the San Francisco Call of August 12, 1912, Dorking began delivering 10 minute lectures about his experience, which rather curiously included that the "lookout gave warning three times of the iceberg that sank the vessel, intimates the officers were incapacitated by champagne, and emphatically refutes the stories that the band played a hym as the vessel went down, as it was impossible to stand on the deck." Afterwards he would answer questions from the audience. 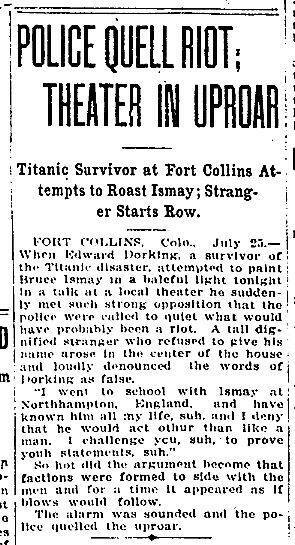 However during one the lectures a member of the audience challenged his "hateful" description of Ismay which according to the Denver Rocky Mountain News of July 26 1912 began a row that was severe that the "police were called to quiet what would have probably been a riot." These two developments suggest that Dorking was prone to embellish his accounts for theatrical effect and so does cast doubt on his accounts, especially his unfounded allegation that "the officers were incapacitated by champagne" (for more information on allegations of drunk crew please refer to this article). However the fact that he was rescued aboard collapsible B does mean that he was within the time-frame to see what he alleges.